Prophets of all lands and ages have succeeded in their God-quest. Entering a state of true illumination, nirbikalpa samadhi, these saints have realized the Supreme Reality behind all names and forms. Their wisdom and spiritual counsel have become the scriptures of the world. These, although outwardly differing by reason of the variegated cloaks of words, are all expressions—some open and clear, others hidden or symbolic—of the same basic truths of Spirit. My gurudeva, Jnanavatar ["Incarnation of Wisdom"; from Sanskrit jnana, "wisdom," and avatara, "divine incarnation."] 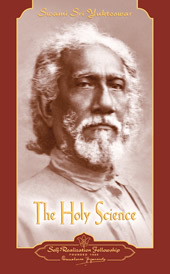 Swami Sri Yukteswar (1855-1936) of Serampore, was eminently fitted to discern the underlying unity between the scriptures of Christianity and of Sanatan Dharma. Placing the holy texts on the spotless table of his mind, he was able to dissect them with the scalpel of intuitive reasoning, and to separate interpolations and wrong interpretations of scholars from the truths as originally given by the prophets. It is owing to Jnanavatar Swami Sri Yukteswar's unerring spiritual insight that it now becomes possible, through this book, to establish a fundamental harmony between the difficult biblical book, Revelation, and the Sankhya philosophy of India. As my gurudeva has explained in his introduction, these pages were written by him in obedience to a request made by Babaji, the holy gurudeva of Lahiri Mahasaya, who in turn was the gurudeva of Sri Yukteswar. I have written about the Christlike lives of these three great masters in my book, Autobiography of a Yogi. The Sanskrit sutras set forth in The Holy Science will shed much light on the Bhagavad-Gita as well as on other great scriptures of India. This Kaivalya Darsanam (exposition of Final Truth) has been written by Priya Nath Swami, son of Kshetranath and Kadambini of the Karar family [family name of Sri Yukteswar]. At the request in Allahabad of the Great Preceptor (Mahavatar Babaji) near the end of the 194th year  of the present Dwapara Yuga, this exposition has been published for the benefit of the world. The purpose of this book is to show as clearly as possible that there is an essential unity in all religions; that there is no difference in the truths inculcated by the various faiths; that there is but one method by which the world, both external and internal, has evolved; and that there is but one Goal admitted by all scriptures. But this basic truth is one not easily comprehended. The discord existing between the different religions, and the ignorance of men, make it almost impossible to lift the veil and have a look at this grand verity. The creeds foster a spirit of hostility and dissension; ignorance widens the gulf that separates one creed from another. Only a few specially gifted persons can rise superior to the influence of their professed creeds and find absolute unanimity in the truths propagated by all great faiths. The object of this book is to point out the harmony underlying the various religions, and to help in binding them together. This task is indeed a herculean one, but at Allahabad I was entrusted with the mission by a holy command. Allahabad, the sacred Prayaga Tirtha, the place of confluence of the Ganges, Jamuna, and Saraswati rivers, is a site for the congregation of worldly men and of spiritual devotees at the time of Kumbha Mela. Wordly men cannot transcend the mundane limit in which they have confined themselves; nor can spiritual devotees, having once renounced the world, deign to come down and mix themselves in its turmoil. Yet men who are wholly engrossed in earthly concerns stand in definite need of help and guidance from those holy beings who bring light to the race. So a place there must be where union between the two sets is possible. Tirtha affords such a meeting place. Situated as it is on the beach of the world, storms and buffets touch it not; the sadhus (ascetics) with a message for the benefit of humanity find a Kumbha Mela to be an ideal place to impart instruction to those who can heed it. A message of such a nature was I chosen to propagate when I paid a visit to the Kumbha Mela being held at Allahabad in January 1894. As I was walking along the bank of the Ganges, I was summoned by a man and was afterwards honored by an interview with a great holy person, Babaji, the gurudeva of my own guru, Lahiri Mahasaya, of Banaras. This holy personage at the Kumbha Mela was thus my own paramguruji maharaj, though this was our first meeting. During my conversation with Babaji, we spoke of the particular class of men who now frequent these places of pilgrimage. I humbly suggested that there were men greater by far in intelligence than most of those then present, men living in distant parts of the world—Europe and America—professing different creeds, and ignorant of the real significance of the Kumbha Mela. They were men fit to hold communion with the spiritual devotees, so far as intelligence is concerned; yet such intellectual men in foreign lands were, alas, wedded in many cases to rank materialism. Some of them, though famous for their investigations in the realms of science and philosophy, do not recognize the essential unity in religion. The professed creeds serve as nearly insurmountable barriers that threaten to separate mankind forever. My paramguruji maharaj Babaji smiled and, honoring me with the title of Swami, imposed on me the task of this book. I was chosen, I do not know the reason why, to remove the barriers and to help in establishing the basic truth in all religions. The book is divided into four sections, according to the four stages in the development of i knowledge. The highest aim of religion is Atma-jnanam, Self-knowledge. But to attain this, knowledge of the external world is necessary. Therefore the first section of the book deals with (veda) the gospel, and seeks to establish fundamental truths of creation and to describe the evolution and involution of the world. All creatures, from the highest to the lowest in the link of creation, are found eager to realize three things: Existence, Consciousness, and Bliss. These purposes or goals are the subject for discussion in the second section of the book. The third section deals with the method of realizing the three purposes of life. The fourth section discusses the revelations which come to those who have traveled far to realize the three ideals of life and who are very near their destination.